Hi Ian – just wondered if you had any experience of the NAD C370 – I have one that just buzzes from the relay once it powers on – I wondered if it could be related to the fault you detail on the protection board – the diode is very discoloured and badly heated. Thanks for the wonderful information. My NAD 370 has exactly the problem that you described. Now I will fix it myself, rather than bringing it to the shop. Warning: make sure you keep the proper orientation of the capacitor when putting it on the other side of the board. Should be: proper orientation of the “Diode”. Thanks Chris, fixed the typo. I suspect you’ve identified the problem with my C370. For some months the relays were very slow to connect the speakers. Then, finally, switching on caused a mechanical buzzing from inside the C370; and a dead amplifier. (Update) Instead of unnecessarily moving the (hot) zener diode: when the dried capacitors are removed their replacements could be soldered on the rear of the circuit board. Another possibility is to solder the replacements on the front but with longer lead lengths (sleeved for insulation) to stand them away from the zener. Beware the printed circuit; it’s not that robust. Yeah, the only reason I decided to swap the zener was to keep it away from the resistors and other components on that little board. The heat damage on the front of the board was pretty amazing. Luckily my PCB stuck together well. What happened to yours? Lifted traces? I’m also curious if this fixed your amp. Your symptoms are a little different from what I experienced, as mine worked fine when cold, and only cut out after it warmed up. No buzzes or anything, just a yellow (IIRC) warning light. If so, I should add a note about other possible failure modes to the blog post. I noticed the two values for the diode so I checked in with NAD. They told me that it was originally a 0.5W but they changed the spec to 5W to improve reliability. Hence the discrepancy. I reckon it’s just a misprint in the service manual, it should definitely be 5w not 0.5. The part number is correctly listed as “02-00240-50” for “D721”. The ’50’ at the end denotes 5 watts, note that D1 and D2 really are 24v 0.5w zeners and the part no is the same but end “05”. I Have a 370, goes into protection on switch-on, but not if the MONO BRIDGE switch at the back is in the on position. I suspect a sticky relay, but I need a circuit diagram to see what is going on when the MONO switch is flipped. Hello! i have the same problem as you, it works perfectly in bridge mode but after i switch to stereo it suddenly goes into protect mode!! I wonder if you did find out what the problem was? did. Do you think that the protection circuit is identical in these amps & receivers ? Hey Sam. I’m not sure, as I’ve never been inside an L53. I found the parts to be visibly damaged when I opened mine, so hopefully a visual inspection will point you in the right direction if you’re having a similar problem. I haven’t been able to find schematics that properly detail the operation of this circuit, so in my case it was just replacing the obviously burnt out parts, rather than legitimate troubleshooting. Hi – I just did the repair explained (replacing 3 caps and also the diode) – but my C370 still goes into protection mode 🙁 Any suggestions about what to do next ? If the behaviour was initially the same as I described (with it working for some time before entering protection mode), I’d be suspicious that you still have bad components on the board, or they weren’t installed properly. If not, perhaps the circuit is operating as intended and protecting the amp from a real fault (e.g. blown transistor or faulty relay)? Sorry I can’t be of much assistance, as I’ve only had to be inside mine that once. Hi Adam, Im in the same situation. Changed the 3 capacitors, but the protection clicks in after a couple of seconds. Did you find a solution? Or buy a new amp?! Mines the same after replacement capacitor kit. When i bridge the amp it’s ok. I allso Replaced all of the big capacitors on the mainboard. Should i replace the diode on the protection board? I’ve replaced the 3 diodes and still in protection mode. Was operating fine until recently when load pop from speakers was shortly followed by protection mode. It powers up normally, then after max 30s clicks into protection mode. Given up for now and replaced with lower powered Yamaha AS501 (which has optic in). Sounds great! Miss the NADs lower volume prowess and punch though…. My question I want to replace the 3 capacitors in the circuit protection in Nad ​​C370 I do not know just what should be a zener diode D721 Does it have to be 24V, 5W, or 24V 0.5W. Sorry for the late reply here — you got caught up in the spam filter. According to earlier comments here, the diode value was increased from 0.5 watts to 5 watts to improve reliability. If you are replacing it, definitely go with 5 watts. I repaired my NAD320BEE with the same problem. it’s in french but I explained that here : http://stephane-rouilly.blogspot.fr/2014/12/reparation-dun-ampli-audio-nad320bee.html if you need to repair yours. Hello Everyone: I have a NAD 370 that seems to lose power to the right channel if I turn the balance completely to the right channel. As I turn it back to the left, it plays just about as loud as the left side. If I turn the volume up while the balance is all the way right, I hear the right channel a bit. In the beginning, the right channel was dropping out completely. Now, it plays on the right channel just about as loud as the left as I begin to move the balance from all the way right. The is no noise as I move the balance knob. I have changed the four relays and the four big capacitors that are known to fail in these amps. Any ideas where the problem could be? . Hello, did you get this sorted? I know it’s a good while ago now but if you still have the problem I may be able to help you track it down. Hello! Did you found out what the problem is ? i have the same problem with mine C370.. Yes, i have the same issue! Hi, It looks like I have just the opposite problem as most folks above. When I turn on the power I have very weak sound in both or one channel for about 7-10 min until it warms up and then it works perfect. Any ideas? Thanks. Hi Paul, that’s pretty much the problem that I had. My big capacitors in the power circuit were drying out, so their values were getting a bit weird. It’s been suggested that as they dry they get out of balance, and the protection circuit sees that as a problem and cuts in. As they charge the reach balance and work fine again. It’s a sign the end is coming. See my comment below for the full fix I did. I did changed exactly the same capacitors that you did about 4 months ago (all 6 of them). 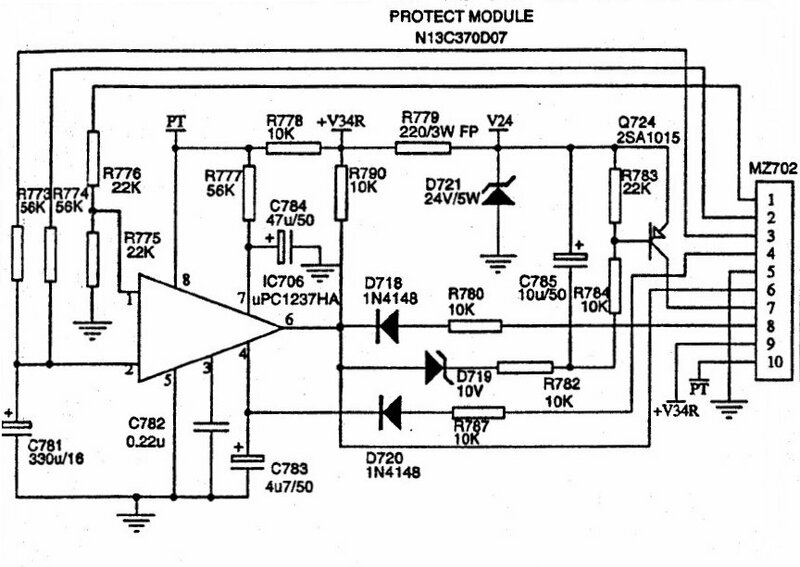 Then after reading post above I did the fix on protection circuit (man those solders are tiny). Still no change. For the 4 big ones I used Panasonic capacitors that are probably not the best choice for audio but were the only ones with 4 pins in right place to fit the board and exact specifications. What I do now is crank the volume up to about 50% or more with speakers off for about 10 min. Then lower the volume, turn speakers on and it works fine. I almost got used to routine :). I’m glad you got it working. Thanks for reply. Thanks a lot for this post. 9 years on and it pretty much fixed my amp! I was having a start up problem where orange protection light came on, then eventually went off and everything worked. Then we moved house and the first time I powered it up the orange light came on, the amp made some noises and the smoke came out. So I replaced all of those with some nice ELNA and Nichicon caps. Very straightforward job. I’m in Australia so had to order some from OS, and there are loads on Ebay. I was very happy with the NAD engineers when I realised they’d included both sets of mounting holes for the very big caps. Put all this back together and turned it on. Green -> orange for a few minutes -> green -> orange for about 30s -> then settled on green. Then I read this post and decided to fix the protection circuit. So I moved the diode to the back and replaced the top 3 caps; 47uF, 10uF and 4.7uF. This is a bit trickier than the big ones, the 4.7uF in particular I found really hard to separate the solder points, but got there. Put it back together, turned it on and it’s been all green ever since. Haven’t had a good listen yet but it sounds pretty good, maybe a bit raw. I’ll run it in for a few weeks before I get too sad. Thanks a lot, you saved my amp. I’ll let you know how it’s going in 15 years. I’m glad this post is still helping people after so long. Sadly my amp is down again. Though this time it’s self-protecting on cold starts rather than once warm. I guess it’s time to crack it open again. Hi Ian, Thanks for this post. My C370 started cutting out around ten years ago so I sent it to be repaired. Recently the same issue has raised its ugly head so I thought Id do some googling and found this post. My amp was cutting out after approx 10-30 mins, then over time this decreased and it now it cuts out on a cold start. I have just got round to replacing the 3 capacitors, but unfortunately it still clicks out after around 2 seconds and the red light comes on. From the invoice of the previous repair it says 4 small / 2 large caps replaced and replaced Psci (?) comps (handwriting not that clear). I can see from the flux deposits that the 3 capacitors that you highlighted were replaced and the larger 25V 470uF one below the other three too. What’s left of famous NAD reliability? You build 1 good amp (in the 80s) & then sell ripoffs for 40 years that’s the power of frickin marketing ain’t it? They certainly made a design error with this amp, but I think that might be an unnecessarily negative view of their products as a whole. Even with this amp, other than this capacitor-destroying issue, I’m quite happy with the performance of my C370. I just redid the above procedure and aligned the amp yesterday, so hopefully it’s back up for another 9 years. Hi ian, thanks for this post. I’ve just bought one of these amps and the protection circuit has already had the caps replaced but many of the other caps in the amp look like they’ve been subject to excess heat and they’re all just 85deg rated. I’m going to replace all the electrolytics in it. I just wondered if you have had to replace any capacitors other than the protection circuit ones? The ones on the amplifier boards look particularly susceptible to heat (namely c311, 322, 411 and 422). On the power supply board c748 and 749 also look fairly toasted by the nearby regulators. So far no, I have not had to replace any other capacitors. Though I have heard others say that they have. I had a pretty good look at the amplifier boards last time I had mine open, and mine don’t seem especially cooked. I have the same problem as many posts in that my C370 works in bridged but protects in stereo. All major caps and the protection circuit have been changed, being careful to use high ripple where needed especially for the two 2200uf 50v. I can’t believe that a connector glitch is the cause as they have been in and out so often. Anyone know a definite cause?